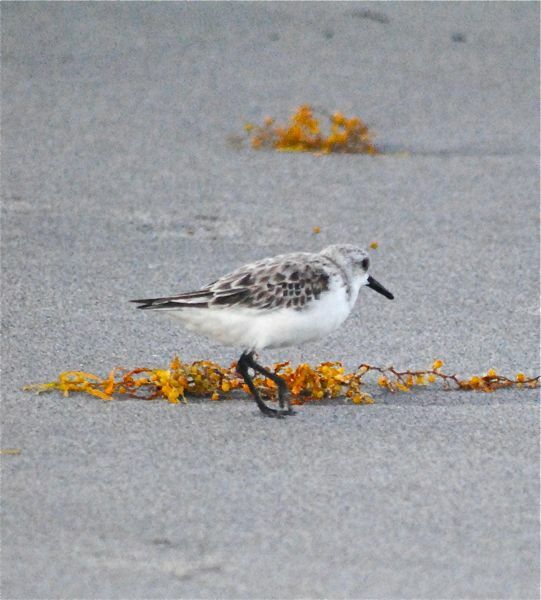 Sanderling, photographed along Delray's municipal beach, Delray Beach, Palm Beach County, in May 2014. 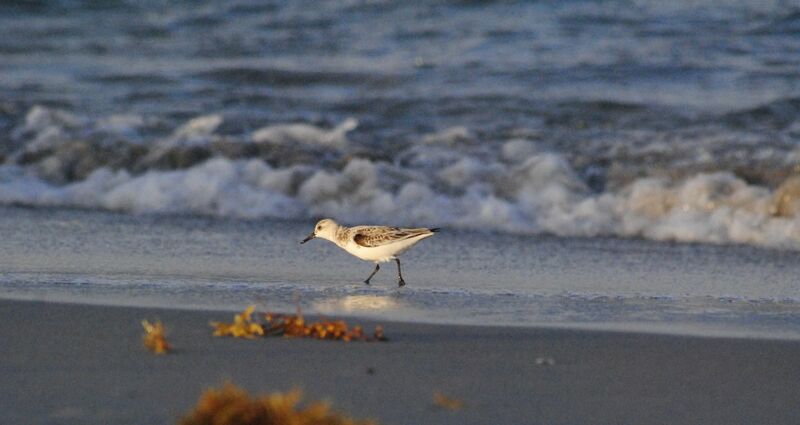 The sanderling, Calidris alba, rates up there as a world traveler with another frequently seen visitor to South Florida's beaches and frequent traveling companion, the ruddy turnstone. Sanderlings spend their summers about as far north as one can go without dropping into the Arctic Ocean, then head south when the thermometer begins to drop, landing on temperate and tropical beaches throughout the world. And in fairly large numbers that can range, in some places at some times, into the thousands. 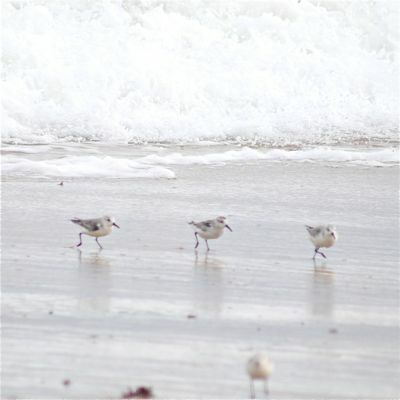 Sanderlings have three trademarks — a dark bill, dark legs and a habit of dancing with the waves. As the water runs in, they scurry in; when the water rushes out, they rush back to the sea's edge, probing the sand for crabs, worms, mollusks and other edible delights. In summer, they are richly colored in reds and browns; in winter, their plummage turns dull grays, whites, blacks. Contrast their appearance in the first three photos, taken in the middle of May, with the three below, taken in late October (coincidentally the day Hurricane Sandy moved off Florida's coast). Some nonbreeding sanderlings will spend the summer here, or more frequently, in South America, rather than spend the energy required to fly back to their Arctic nesting grounds. They are small birds, among a class of sandpipers called peeps because of their tiny size. They are less than eight inches long, with a wingspan that is just shy of 14 inches. Sanderling females are the nest builders, scooping out a small depression in the ground and lining it with bits of willow, grass, moss or other handy vegetation, usually in the open. Both males and females share incubation duties, which last about three or four weeks. Newborns are ready to wander away from the nest after a day. If a predator nears, the birds will freeze; if the predator persists, they will feign injury and walk away from the nest hoping to draw its attention. 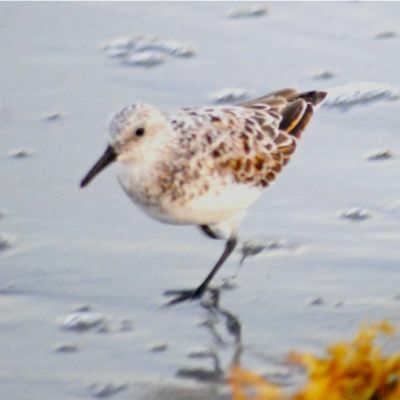 Sanderlings are generally monogamous, but females on occasion will mate with other males during the breeding season. Although the bird is quite common on our beaches, there are indications that its population is declining. 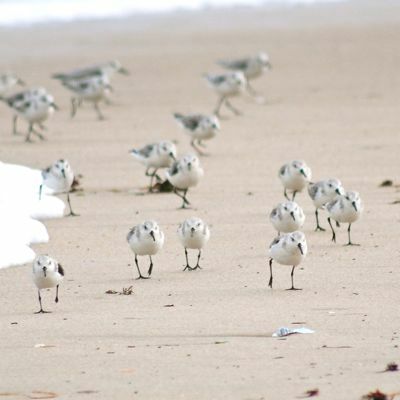 According to Cornell Lab, the sanderling population is estimated at 700,000 globally of which about 300,000 inhabit the western hemisphere. 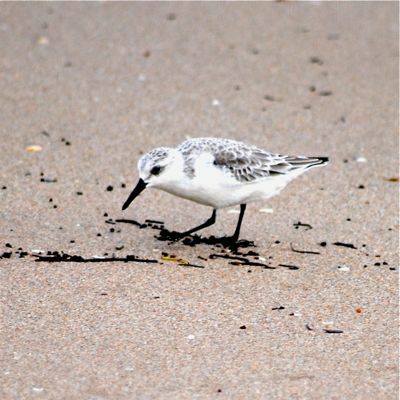 Sanderlings are members of Scolopacidae, the scientific name for the sandpiper family.